Blusing Bride Rose of Sharon unfolds with large double pink flowers that start in mid summer onto frost when very few of other pink flowering shrubs are in bloom. Blushing Bride shrub grows in sun or partial shade and in most any soil. This Hardy Hibiscus growth rate ranges from slow to moderate but transplanting is easy. Hibiscus syriacus also known as Rose of Sharon, swamp mallow, rose mallow and althea. Prune rose of sharon bushes in late winter or early spring. Frequent severe pruning gives fewer but larger flowers; no or little pruning gives many small flowers. Peak blooming takes place in August. 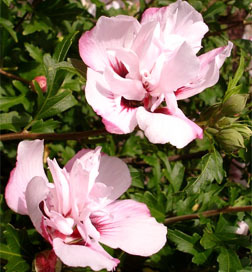 Space rose of sharon 4 to 5 feet apart in a row to create a beautiful flowering living fence hedge. ﻿Blushing Bride Hibiscus Shrubs are shipped as one to two foot tall field grown bare root plants.